Red is one of my favorite colors to wear. It makes me feel vibrant and happy and is just a good color on me. How do you feel about red or bright colors in general? Do you wear bright colors like red or do you stick to neutrals? Whether you go for the “in your face” look of an all over red outfit or just like to add a little punch of color, you are going to love these looks by some of my favorite fashion bloggers. 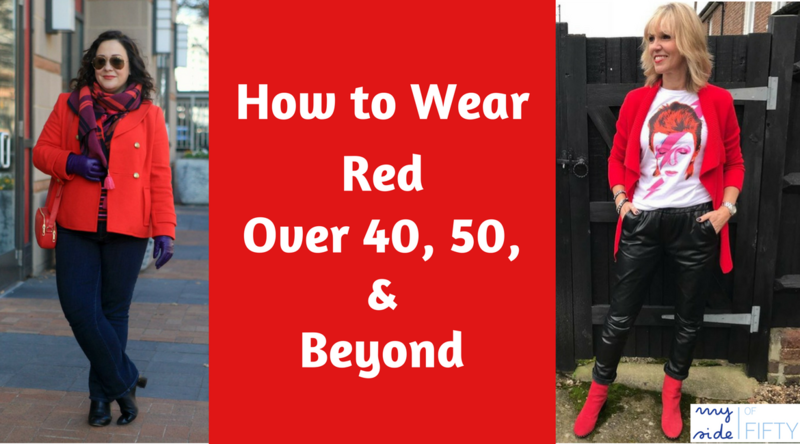 Here’s How to Wear Red Over 40, 50 & Beyond! Shauna from Chic Over 50 pairs her blinged out jeans with a simple red sweater, bag and animal print shooties. Notice her pretty red toenails. If nothing else, red on your toes makes you feel good! Follow Shauna on Instagram. Kimberly from KandidlyKim posts great looking everyday style on her Instagram feed. Everyday style – that’s exactly where I live! Her red vest brightens up an everyday winter outfit – a sweater and jeans – and makes it a little special. Did you notice how Shauna and Kim are both wearing animal print shoes with their outfits? Such a fun detail! Lynne Meek, a personal stylist in the UK created this look that’s a little bit, or maybe a LOT Rock ‘n Roll! She pairs her leather joggers with a red jacket, graphic tee, and red booties! Follow Lynne on Instagram! When I approached Judith about using this great picture of her in my “red” post, she kindly informed me that these super cute cigarette pants were pink. And while if I look close, I can see it, I am going to pretend that they are red. Either way, this is a polished and modern look, perfect for business or lunch out. Follow Judith on Instagram. I read just about every post that Jess from Elegantly Dressed and Stylish writes. I love her always feminine look. This gorgeous lace sleeved top and skinny black pants make up the perfect Valentine’s Day date night outfit. And good news! Check out Jess’ post to get the links to both pieces! They are in stock! Jess also wears a lot of dresses (as one with a feminine style would). But much to my surprise this is a skirt and top. Can you tell? So pretty. Follow Jess on Instagram. I have a thing for red coats. I have ALWAYS wanted a red coat! And this year, I finally got one. I feel like a movie star every time I put on this Ellen Tracy Double Breasted Coat. It’s super soft, super warm and is now deeply discounted! Check it out here! I’ve paired it with my Talbot’s Cable-Yoked Sweater (on sale in lots of colors) which I love so much I also bought it in navy. My NYDJ Marilyn Straight Leg STRETCH Jeans and my Kendra Scott Harlow Statement Necklace (some colors are on sale). Follow me on Instagram. Back to this fabulous outfit – all from Talbots. The red peacoat, scarf, blouse, curvy jeans and cute red crossover bag are all from Talbots. And what about that POP the purple gloves give her whole outfit? Head on over to Alie’s post and get the links to all these fabulous pieces. Super DEEP discounts on each one. C’mon, you know you can’t resist a good sale! I would never wear these two fabulous outfits because I just don’t have the imagination to think of putting them together! But they are perfection! That’s why I love following fashion bloggers! They inspire me to think outside of the box. First is my friend Jodie from Jodie’s Touch of Style – one of my daily must-read blogs. She’s wearing a red plaid blouse with her Fair Isle sweater (that she knitted herself, by the way ) and a red purse with lots of fun detail. The lady knows how to pattern mix – what can I say! Doesn’t she look great! Follow Jodie on Instagram. And on to Shauna. This is a red sweater layered over a peach lace dress! I could never imagine a sweater over a lace dress or red and peach together but doesn’t it look so chic? And those animal print shooties! My goodness, I am inspired! And for those of you who aren’t going to make your whole outfit revolve around red, here are two ways to just add a bit just for fun. Paula from Dimples On My What? added this cute beanie to her all-black outfit. Doesn’t her complexion look rosy? Follow Paula on Instagram. Finally, Sue styles her boyfriend jeans with two items from Cabi’s Spring Line. The pretty red floral print Flipside Blouse and the Times Jacket. Get these two pieces and check out Cabi’s new Spring line here. What about you? What’s your favorite way to wear red? Thanks so much for featuring me, what an amazing and inspiring group of women and their red looks! Alie – I’m so pleased to feature one of your fabulous looks! Thanks so much Cathy for the feature! I love red ♥️ definitely a favorite color. So glad you liked it, Jess! Your reds here are right on the mark!! I love the shades – they’re vibrant and not a blue red. That color of red is what looks best on me. Marissa – so glad you liked the looks. I love how each and every one of the ladies styled their red! You are way too kind, Cathy!! Because you too can mix prints….it’s just like anything else. A little practice and trial and error and it’s really fun!! Heck, you’re incredibly smart and adventurous (just look at all of the blogging classes you take) that mixing prints is like your personality (smart and adventurous!! I absolutely love your red coat!! I bet you’ll be wearing it more than you thought—it adds so much pep to any day!! Since we’ve actually had a winter here in Houston, I am wearing it a lot! And I love it. I want to come to Denver some day and let you take me shopping and style me! I LOVE red! But I find myself shying away because red lipstick just doesn’t stay on like it once did. Still, after reading this post I’m going to dig out some of my favorites. Liz – have you tried a lip primer? That can help your lipstick stay on and not bleed. I’ll bet you look great in red! Red is so much fun. My favorite look from above is a punch of red–sweater with jeans or sweater vest. Thanks for sharing–and giving me some ideas for energizing my wardrobe..
Yea! So glad you found some inspiration! I love all of the red. I don’t wear much red because I find it hard to find a shade that looks good on me. Yes, there are so many shades of red and it takes some looking to find just the right one! Glad you liked all the looks in the post! I LOVE you ALL in RED! I’m kind of a boring neutral person! HAHA I do love to wear red though, and I feel like red looks good on me! Keep up being beautiful in your 40’s, 50’s, and beyond! Natalie – Red does have a way of perking you up, doesn’t it? So glad you enjoyed the post. A touch of red this time of year is just what we need! i wouldn’t wear red pants, but I do like a touch of red. i have a favorite red bag. I love the animal print shoes. The red coat looks AMAZING on you, you should totally trust your instincts! Thanks for your sweet words about my red coat. I love it. And I love animal print paired with red too! Shauna – I am so honored that you allowed me to include you. I love your Instagram feed. Your creative styling inspires me. Julie – I know what you mean! It’s hard to get motivated to dress nicely when you work from home… at least for me. I tend to go for comfort. But these ladies and their great looks inspire me! I love all of these looks, Cathy! Red always looks great and as we age we should wear colour don’t you think? thanks for linking up and sharing at #overthemoon link party and have a great week! Aren’t they great? So glad you liked the post, Sue! I love red too! Such a vibrant color! These are all great ways to wear red. I have a love/hate relationship with red, lol. I love to wear red! I just read your post on styling red pants and you look great!